Innovation is given a new meaning with our wide range of beautifully designed stainless steel bud holder in different sizes. We provide flower bud holder, metal flower holder and metal bud holder. Treasure trove of miscellaneous snazzy and eye soothing designs, our stainless steel bud holders appeal the senses of everyone. 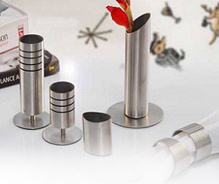 Extremely used in residential as well as commercial buildings for the purpose of decoration, our range encompasses bud holder, flower bud holder, metal flower holder, metal bud holder, stainless steel bud holder, stainless steel bud pot, metal bud vase, stainless steel bud vase, stainless steel bud stand, flowers holder, metal flower stand, stand holder and other alluring ones. Be it mantle, center table or dining table, these beautifully crafted stainless steel bud holders provide a perfect mirrored finish to the colorful brilliance of fresh flowers kept inside it. 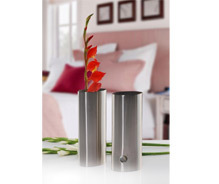 Adding colors and vibrancy to the flowers placed inside, these flawlessly crafted stainless steel bud holders match up to the aesthetic demands of residential and commercial interior decor where looks matter most. These also lighten up the mood and add on to the colors of fresh flowers kept inside.